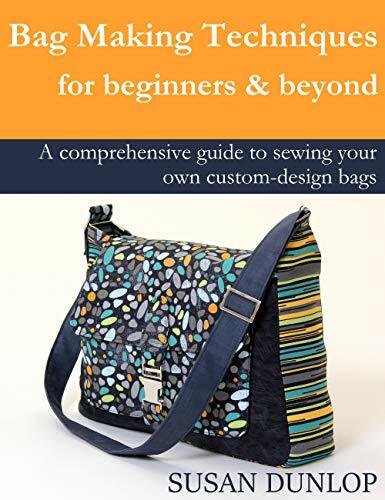 Printed book and eBook of Bag Making Techniques for Beginners & Beyond is now released! So excited to let you know that the printed copy and the eBook version of my new book, Bag Making Techniques for Beginners & Beyond has now been published! They are available to order on Amazon, worldwide! Whoop, whoop! I hope you will all help me to spread the word about my independently published book, no big publishing houses here, just me! Thank you for your support and happy sewing! Make the best bags with the help of my new bag-making book! It’s only a few weeks until my new bag making book, Bag Making Techniques for Beginners and Beyond, is released on Amazon! It will be available as an eBook, for pre-order now, and as a printed book which can be ordered from the release date of 26th March 2019. So exciting! So what’s in this new book and what makes it so different to all the other fab bag making books out there? Well, rather than being a book of ready-to-make projects, it’s a comprehensive guide on how to design and make you own bags, adding a variety of elements as you go along. I’ve aimed this book at anyone wishing to confidently adapt a bag-making pattern, to suit their own needs, or anybody who’d like to start realising their own creative ideas. I begin with lots of advice on fabrics, tools and using stabilisers. For anyone who’s never made a bag before, I’ve included a starter project for making a fully lined tote bag, so that you can get an initial understanding of simple bag construction. I then take you through an abundance of techniques, know-how and tips on making more complex bags. You’ll learn how to make and add a variety of pockets, handles, closures, bases, bag frames and how to install bag hardware. I’ve covered a range of basic techniques, through to the more advanced methods, so you’ll be able to take your bag making to a level you can be truly proud of! Pre-order your copy of Bag Making Techniques for Beginners and Beyond, on Amazon today, and be one of the first to get making the best bags ever! New eBook! Bag Making Techniques for Beginners & Beyond! I’m so excited to announce my new eBook, available for pre-order now on Amazon! Bag Making Techniques for Beginners & Beyond is a comprehensive new sewing guide to get you designing and creating the best bags ever! There are so many different styles of bags; the possibilities of creating a unique accessory are endless. The techniques I’ve covered in this new book will arm you with the knowledge to adapt ready-made patterns and to design your own bags from scratch! The book begins with lots of helpful advice on choosing fabrics, how to use stabilisers and which tools to use; the basic elements for making the best bags. 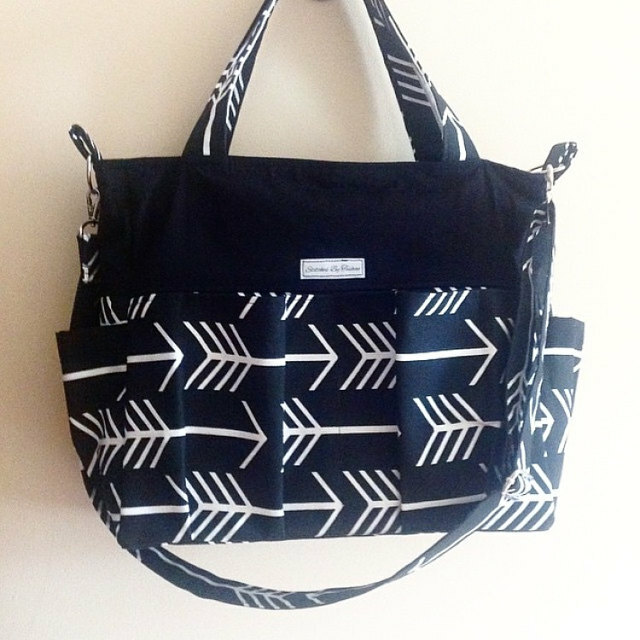 If you’ve never made a bag before, start off by making the lined tote bag project. You’ll then be able to work your way through the technique sections, learning about different construction methods and how to make more complex bags, by adding a range of bases, pockets, zips, handles, flaps, hardware and so on. I’ve included a whole range of techniques, tips and know-how, which will enable you to make fabulous bag designs you can be truly proud of! Pre-order your copy now, for release date 26th March 2019! 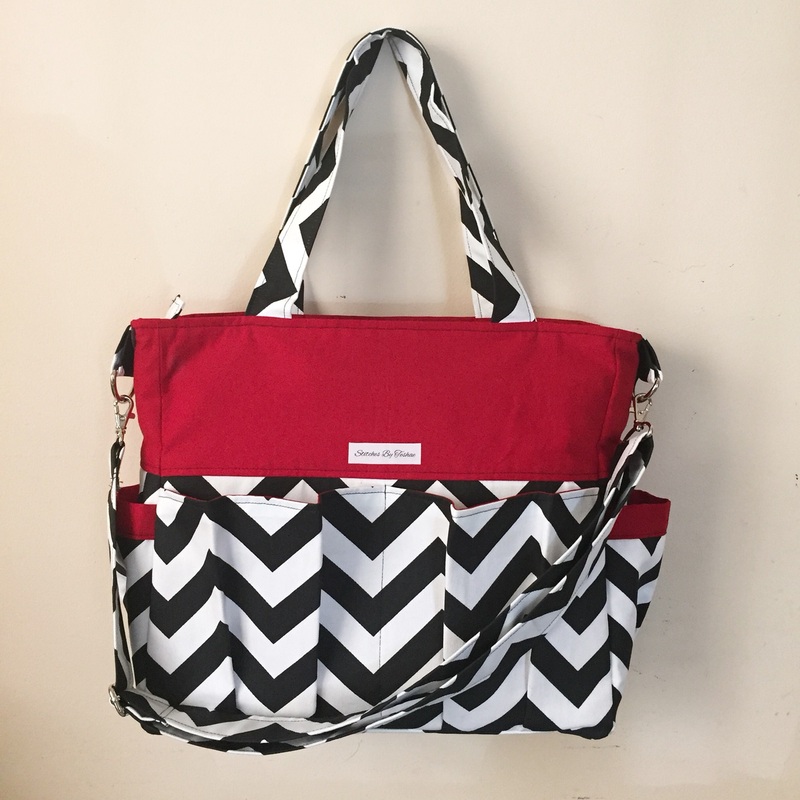 Another new sewing pattern that I’ve just released and added to my Etsy shop is the brand new ABC Diaper Bag Pattern (baby changing bag). This was so much fun to make! It’s a big, roomy bag with a full zipper closure and lots of pockets. This nappy bag pattern will help you to make a substantial bag which is double interfaced for strength, durability and stability, so it’s not floppy. The interior pockets are elasticated to keep things in place and it also has four exterior pockets too. So you’ll be able to carry all the bits and bobs you need to for baby or toddler! I’ve placed this pattern as suitable for advanced sewers, as it’s got lots of pieces and lots of techniques to do as you go along. It’s certainly not for the faint-hearted, that’s for sure! However, it’s a project that you’ll just love getting your teeth into and, if you’re a confident intermediate sewer, by all means give it a go. I’ve ensured that I’ve included lots of helpful advice, instructions and full-colour images so that you’ll be able to make a bag to be really proud of! Hope you like! Happy Sewing! I’ve been busy creating some new sewing patterns which are available in my Etsy shop now! (15% off this week too!!). So the first up is a newly updated version of my popular Smart Phone / iPod Sleeve sewing pattern. It’s been totally revamped and now includes 3 sizes of pouch to suit most modern smart phones. Have a look at the new Smart Phone Sleeves Sewing Pattern x 3 sizes in my Etsy shop! Following on from my original Tri-fold Wallet sewing pattern, I’m excited to bring you an updated version of it! The new pattern includes an optional zippered coins pocket, as well as having sections for bank cards, cash and coupons or notepad. It closes with a wide Velcro tab. This wallet pattern is suitable for intermediate sewers, but it has really easy-to-follow instructions with lots of colour images, to help you at each step. The pattern is available for instant download and it includes a complete set of full-size pattern templates, as well as all the cutting measurements if you prefer to use a rotary cutter and ruler. For further details, check out the new Wallet Sewing Pattern in my Etsy shop. Below are some of my customers’ handmade wallets which they made from the original Tri-fold Wallet pattern. This wallet is very similar in style (not including the coins pocket) and it has two types of closure tab – Velcro or press fastener. Bagmaking Tips – how to make better bags! Making bags and accessories is such a fun, rewarding thing to do! Not only do you get to pick out gorgeous fabrics but you also get to make something that’s looks good and is practical too! However, if the finish of your bags isn’t quite what you’d hoped for and you’d rather stick it away in the wardrobe, than show it off, read on for some simple tips. You’ll be making the best bags ever, before you know it! Press as you go: Never skimp on pressing fabrics before using them and keep pressing each part, as you sew, to set in the stitches and give a neat, crisp finish. Also ensure you neatly press any folds or pleats, during construction. Always you a clean pressing cloth to avoid shiny marks or dirty residue off the iron. Cut accurately: it goes without saying that if you’re squares and rectangles are all wonky then you’ll not be able to achieve a good finish. If you find it difficult, or you just want to save time, invest in a rotary cutter, acrylic ruler and cutting mat! You won’t regret it and they’re well worth the cost! Interfacing: Although it takes up extra time and patience, it’s so important to use suitable stabilisers when making bags. Stabilisers are the hidden layers between the outer and lining fabrics, which offer structure, stability and enduring strength. They come in different weights, thickness, softness, fusible or sew-in; interfacing, interlining or fleece options. Remember to use good quality stabilisers, they really are worth the extra money. I use Vilene products which are readily available in the UK and Europe and I also like the USA Pellon brand which is an equally fantastic product. This is available from most good fabric/sewing stockists across America as well as being available from some sellers in the UK too. Machine baste: I always use the machine’s longest stitch length to baste within the seam allowance. It’s faster than hand-basting, doesn’t need removing and strengthens the seams as well. So if you have a 1cm (3/8”) seam allowance, baste approx. 5mm (1/4”) from the edges. Once you’ve machine-basted pieces in place, the pins can then be removed which makes sewing up a project so much less fiddly and it saves time, rather than doing it all by hand. Double-sided basting tape: make inserting zips a breeze and achieve a professional looking finish by using basting tape. This is an amazing invention! You just need to attach the tape along the edges of a zip and this will hold the zip in place while you sew, instead of using pins or having to hand-baste! It can be sewn through, without leaving a sticky residue on the needle, and there’s no pins to try avoid sewing over! Win, win! Pins versus sewing clips: when the layers you’re sewing together are getting too thick for pins, the best thing to use instead are sewing clips; the type which are normally used by quilters. They are essentially like mini bull-dog clips but they are made with flat, wide clip parts so as to hold layers of fabric securely without leaving marks or indentations. They’re fantastic when you’re sewing together layers of fabric, lining, interfacing and fleece and you just carefully remove each one as you sew up to it. So there you have it, some easy-to-follow tips for making your bagmaking projects more enjoyable to make and more pleasing to finish. I hope you find these tips useful. If you’d like to have a go at making any of my bags and accessories, head on over to my Etsy shop SusieDDesigns Sewing Patterns and start planning your next project! Hi everyone! Hope you’ve all had a good start to 2019 and that you’ve had some time to fit in some crafting. What have you been making? Feel free to share. I’ve been really busy over the past few months, revamping the main website for my SusieDDesigns‘ brand. Have a look, I’d love to hear what you think! New! The fun, co-ordinating Witch Hazel Halloween Sewing Pattern Collection includes three easy-to-make sewing projects, perfect for beginners and beyond, which you can stitch up for the kids, just in time for Halloween. There are spooky-themed, fabric party bags, a trick-or-treat tote bag and a quilted table-topper mat that can be used year after year! You could use any Halloween themed fabric you like or even try solid fabrics, in oranges, greens and black! I used these fabulously spooky designs from the Witch Hazel collection, by October Afternoon, for Riley Blake Designs. This collection is a great introduction to bag-making, patchwork and quilting. I’ve designed the projects so that they are easy to follow, with plenty of full-colour images to guide you from start to finish. My latest sewing pattern release is this snazzy Summer Beach Bag, ideal for all those hot summer days or even all year round, as it’s sure to brighten up a dull day! The fabrics I used to make this bag are Lucy’s Crab Shack by Sweetwater for Moda Fabrics. Make this large tote bag in fun fabrics and hit the beach in style. It’s big enough to carry all the essentials and it has a useful interior pocket to keep a few things separate. You could also take this bag on holiday; pack it flat in your suitcase and use it when you’re on the beach or out and about exploring. The Summer Beach Bag sewing pattern includes easy-to-follow instructions with lots of colour images and a full set of printable pattern template pieces. If you’d like to make this bag, the sewing pattern is available in my Etsy shop now. Happy Sewing! I used a fat quarter bundle to make this modern hobo-style handbag. The use of pieced panels allows you to show off coordinating prints at their best. For a professional finish, I added a twist/turn lock for the closure. I used some gorgeous fabrics from Dashwood Studio, called September Blue by Susan Driscoll. This sewing pattern is suitable for intermediate sewers but could be tackled by confident beginners who have made a bag or two already and feel ready to take on a more challenging make. It includes easy to follow step-by-step instructions, with plenty of colour images throughout, and full-size pattern pieces are provided for you to download and print at home. If you’d like to give this bag a go, you’ll find the sewing pattern in my Etsy shop here. Happy sewing! New Bag Making Sewing Patterns Coming Soon! It’s been a while…again! I’ve just been quietly working away in the background on old, current and new projects – including my new handmade crafts offering over on Etsy, PomPomPets®. More on them in a later post, though, as I want to let you know about my new, upcoming bag-making patterns! In the meantime, if you’d like to have a look at my currently available sewing patterns, they’re available over in my Etsy shop, SusieDDesigns.